A train has collided with a passenger bus in the Ryazan region, southwest of Moscow. Six people are reported dead and seven more have been injured. The cargo train crashed into the bus that was crossing the railroad tracks. Some passengers remain trapped in the squashed vehicle. 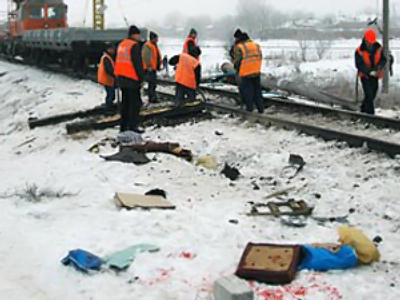 According to ITAR-TASS news agency, a total of 15 passengers were on the bus.